Bare midriff in autumn | Outfit post - Do You Speak Gossip?Do You Speak Gossip? Vest: Paranoia (old), cropped top: local shop, skirt: Zara, bag: D&G, booties: Minelli, sunglasses: Donna Karan, cuff bracelet: Dyrberg/Kern. 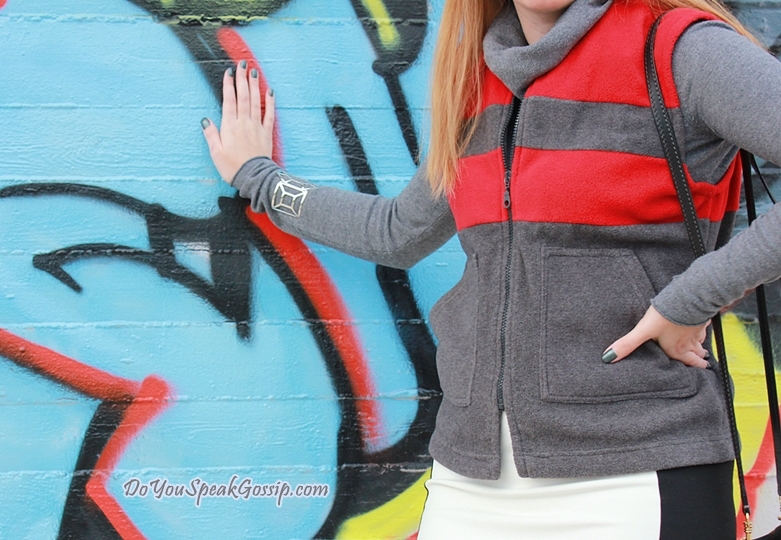 This fleece vest is amazing, really warm and comfortable. I had it in my closet for many years but I’ve barely worn it. It has a matching skirt, and jacket. I bought it as a teenager, but it still fits me. It kept me warm, but at the same time I had the chance to wear my cropped top as I wanted to. Of course I had one more jacket in the car, for later, after the sundown. I like experimenting (within limits) from time to time, with clothes I already have in my closet, to create new and edgier outfits, that will get me out of my usual comfort zone, but without losing my personal style. I really liked the result of this inspiration (even though in some photos my cropped top is higher than I would like it to be), and I really hope you like it too. These booties, were bought in Paris some years ago, and haven’t been worn much, because they’re a bit narrow. So I thought it was the perfect chance to wear them with this outfit, and at the same time save them according to the rules of Shoeper Shoe Challenge by Shoeperwoman.com. This is Shoe Save #36/63. You can find many similar styles on the e-shop spartoo.gr. Of course an edgier outfit calls for minimal accessories, so I limited myself to this beautiful cuff bracelet. 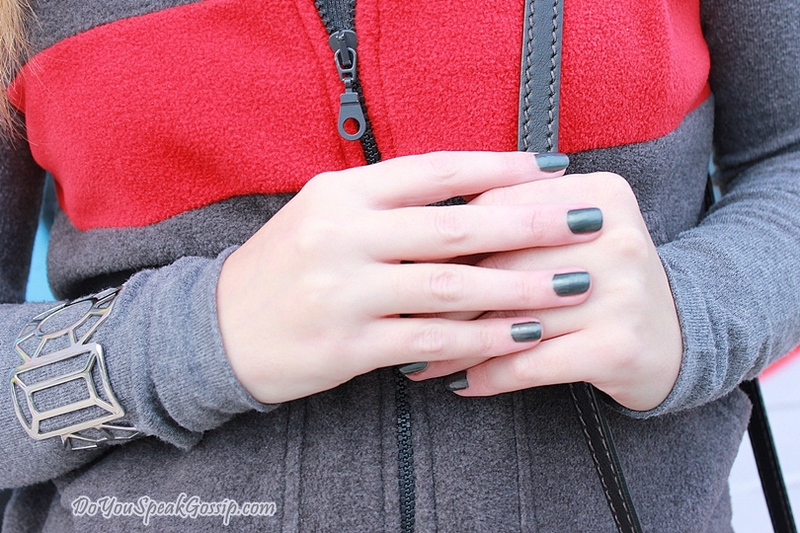 My manicure coincidentally matched my outfit: Chanel Black Pearl. I have scheduled some posts for you for the time I’ll be away, so don’t forget to check my blog, because I don’t know if I’ll be able to post my links on my social media. I’ll try to read and approve your comments as often as I can! Have a nice weekend! I’ll miss you all, but I’m hoping to take nice photos to show you when I get back! Kisses, and don’t forget to follow my blog any way you like. Hey M. Nice outfit, glad you got a day warm enough to wear it! Really like the 7th pic down, you look stunning. Loved the background you chose for these pics too. Hey Laura! Thank you very much! Glad you liked the outfit. It was quite warm that day indeed. Our weather is not so bad so far. But it is was much better then, when we took these photos. Thank you! We’re flying tonight, and I’m so excited but also really stressed. I’ll try to take as many photos as possible. Πολύ ωραίο. Σε βλέπω και κρυώνω ειλικρινά. Εδώ με 12 βαθμούς και μόνο που σε βλέπω βρε κορίτσι μου σηκώνεται η τρίχα κάγκελο που λέμε. Λάτρεψα την φουστίτσα. Φιλάκια πολλά και μπράβο και πάλι! You look amazing in those skirt and crop jumper!!! We have pretty the same weather here in Ireland as well.Just tonight its not raining, but temperature has dropped to 0C its freezing! Hope you will have lots of fun and wonderful spent time in London!!! Thank you so much Ramona! I had a great time in London! Came back just yesterday afternoon and even though I’m a bit tired, I’m preparing my next post for tomorrow, and doing some catching up with my blog. The weather in London was very cold. Here in Greece is much warmer, even though it was raining all day today. The grey and red jacket is really cool as well! Thank you very much again! It wasn’t that cold when we took these pics so it was ok to go out like this. The fleece vest helped a lot with the cold. I couldn’t stay out in a cropped top all day of course. But with the fleece vest and a jacket I was kept warm. Glad you liked it. tolmiri se vriskw tetoio kairo!elpizw na pernate teleia! I moda thelei tolmi! hehe Ela mwre den eixe toso krio otan vgalame tis fwtografies…to gilekaki itan fleece kai me kratise poli zesti….ntaxei to vradi otan girisa spiti arga, psilokriwsa allal tpt idiaitero…Perasame poli kala..tha sta pw, kai tha sas ta deixw otan vrw xrono na perasw tis photo. Thank you so much Katoula! 🙂 We had a great time, even though the weather wasn’t ideal for tourists. hehe We needed one more full day, to see everything we wanted to, but we’re really pleased with what we managed to see in such a short time. I’ll post some pictures when I get the chance to go through the huge amount of photos I took in London. hehe. That is a perfect cropped sweater!! Love love it!! Thank you very much! I also have it in navy blue! Glad you liked it. The weather was still really mild when we took these photos, so I wasn’t at all cold. The next days the temperatures dropped a lot, so I’m glad we managed to take these photos before the cold came. I would never go out like this if the weather was indeed cold. I hide under many layers in law temperatures, like you! But I had this outfit on my mind, and I really wanted to wear it before it was too cold to go out like this. We had a great time in London. Can’t wait to go through all the pics I took and choose some to show you. Απλά υπέροχη! Εχω εκφράσει και στο παρελθόν το πόσο πού μου αρέσει η φούστα σου αλλά αυτό το τοπ την απογείωσε! Φοβερό λουκ! Πράγματι το φόρεσες τις κατάλληλες μέρες γιατί πια ο καιρός έχει γίνει για τα καλάχειμωνιάτικος! Ontws, twra exei pagwsei,…ena mina prin itan akoma zestes oi thermokrasies….